The spinach pesto makes a delicious topping for these tilapia fillets. The pesto is easy to fix with help from a food processor. Pecans provide texture while Parmesan cheese and garlic flavor the pesto. If you have extra pesto, serve it on the side or freeze it for another meal. Lightly butter a 9-by-13-by-2-inch baking pan or shallow casserole. In a food processor, pulse about half of the spinach leaves with 1/4 cup olive oil, pecan halves, Parmesan cheese, garlic, and 1/4 teaspoon salt until the mixture is a fine consistency. Arrange remaining spinach leaves over the bottom of the baking dish. 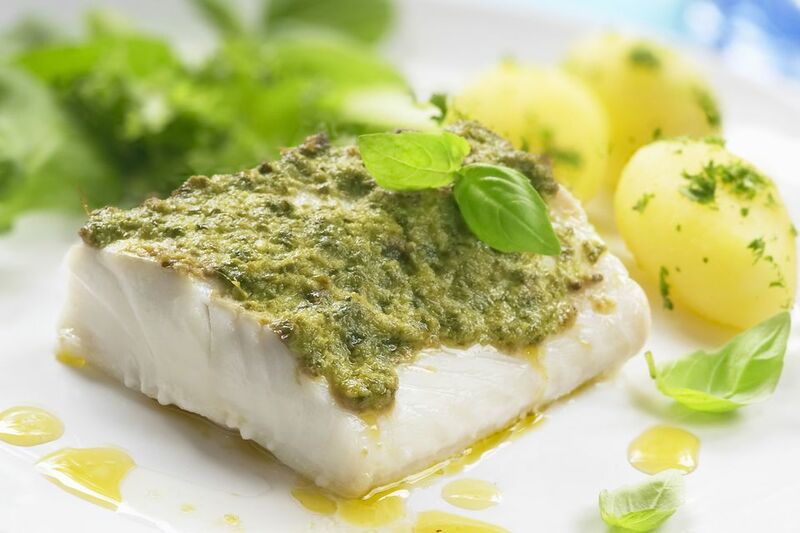 Place a tilapia fillet on the bed of spinach and put about 1 tablespoon of the pesto mixture on the fillet. Spread lightly to cover most of the fillet. Repeat with remaining fillets and pesto, overlapping fish slightly as needed. Bake for 15 to 20 minutes, or until tilapia flakes easily with a fork.